A common emergency that firefighters encounter is flammable liquid spills and fires. Statistics even show that flammable liquid releases account for nearly 66 percent of all spills, and even if you have not already been to a flammable liquid fire, chances are very good that you will sometime in your career. Therefore, it behooves us to train for these emergencies, to handle them more efficiently and to keep our health and safety intact. Perhaps the best weapon to handle flammable liquid spills and fires is Class B foam. There have been many fine articles written about foam and how to use it, yet many firefighters seem to misunderstand and are confused over foam technology. One author even referred to foam as the “Voodoo Science” because of the general feeling firefighters have concerning foam. In reality, Class B foam applications are fairly simple. Some of the reasons for the firefighter aversion to using Class B foam may be from a lack of experience with it, both in training and in actual incidents. Not all flammable liquid releases require flowing foam, so the experience of using it at emergencies is not enough to give a firefighter a confidence level. Also, since foam concentrate is expensive (over $25.00 per gallon), fire departments do not train with it frequently enough to leave a lasting impression on the people who use it at spill scenes. Consequently, when Class B foam is needed at an emergency, the operations do not go as smooth as we would like. Outside of the equipment used in producing finished foam and the proper techniques for applying finished foam, the most perplexing issue for firefighters is the calculations for the foam concentrate that is required at a spill. While there are foam formulas to figure the concentrate needed, many, if not most, firefighters will be hard-pressed to remember the formulas while in the midst of an emergency. The formulas are complex, and in times of stress the simpler operations can be made, the better off responders will be. Years ago the philosopher Thoreau stated that we must “Simplify, Simplify, Simplify!” This sentiment is also of value when it comes to foam concentrate calculations. Area X Critical Application Rate (CAR) X Eduction Rate (ER) X 15 = Foam Concentrate Needed. The "Critical Application Rate" (CAR) is the minimum flow of finished foam per square foot to extinguish a flammable liquid fire. The CAR was found for different fuels through extensive testing by the National Fire Protection Association (NFPA). The CAR for hydrocarbon fuels has been calculated to be 0.1 gallons per minute per square foot (0.1gpm/ft2) and the CAR for polar liquids, like alcohols, has been calculated to be 0.2 gpm/ft2. The third factor in the formula is the "Eduction Rate" (ER). Class B foam needs to be educted at a certain percentage mixed with water in order to produce an adequate foam solution to cover a spill or extinguish a flammable-liquid fire. For many foams the eduction rate for hydrocarbons is 3% (.03) and 6% for polar liquids (.06). Some Class B foams use 3% eduction rates for both hydrocarbons and polar solvents which simplifies the formula further. There is even one new foam on the market that is educted at 4% for both Class A and Class B foams. The fourth factor in the foam formula is a safety concern that comes from NFPA 11- Standard for Low Expansion Foam. NFPA 11 states that we should have enough foam concentrate to flow finished foam for a minimum of 15 minutes at the critical application rate. There is one additional factor, which is not in the formula, that is called the “X Factor.” The X Factor is the aeration expansion ratio that the nozzle produces. Since some fire departments may use non-aspirating nozzles with no aeration capability the X Factor was not put into the formula. If you do know the expansion ratio of your nozzle, or nozzle attachment, this factor can be added. For example, a Task Force Tip (TFT) will aerate, or expand, the foam solution at the nozzle by a factor of 4 (4:1). By adding the TFT nozzle attachment for foam operations, the expansion ratio is 8 to 1. This simply means that air has been added to the foam solution to expand it 8 times the original volume. Aerating nozzles and attachments greatly extend your foam supply by covering more of the spill. To summarize, the following formulas can be used at spill scenes involving flammable liquids. Now, the chances of a firefighter accurately calculating these formulas while at a flammable liquid spill with fire are fairly low. There is just too much to recall especially in the middle of a stressful situation. There is a better way! These formulas are now in a manageable and easily recalled context that many firefighters have found very useful at flammable liquid emergencies. To reinforce the use of the simplified formulas the following examples can be reviewed. How much foam concentrate is needed to cover a 20’ X 20’ spill of gasoline? The second result here is higher because of rounding but still on the safe side. How much foam concentrate is needed to extinguish an alcohol fire that is 30’ X 40’? Remember, in the above examples the "X Factor" was not part of the formula. With a nozzle attachment that has an expansion ratio of 8X your foam supplies will go eight times farther. One last concept to realize with foam operations is what your limitations are. In other words, how big of a flammable liquid spill will your available foam concentrate reserves cover? This spill area can be calculated before an incident by using the following formulas. As an example, if you have 20 gallons of foam concentrate and you have a gasoline spill, how big of an area can you blanket with foam? You are limited to an area of approximately 60’ by 60’ for hydrocarbon spills. Another example: If you have an ethanol spill and 20 gallons of foam concentrate, what are your limitations in terms of the area you can cover? You are limited to an area of approximately 30’ by 30’ for polar liquid spills. Knowing your limitations is important because it would be wasted time, effort, and foam to initiate foam operations on a spill that is larger than you can cover alone. The fire may burn back and consume the foam that you applied if you did not completely cover the area. It would be prudent to elect to wait until more foam arrives before you begin foam operations. It is hoped that these simplified formulas work for you and the "voodoo science" of foam operations has been demystified. Still, to stay adept at foam operations, practice is required, both with calculating foam concentrate needs and with your foam-producing equipment. Additionally, keep your limitations in mind. Familiarity through training and drilling is the key to handling flammable liquid releases efficiently and safely. To begin with let us define some terms common to firefighting foam. A concentrate based on fluorinated surfactants plus foam stabilizers to produce a fluid aqueous film for suppressing hydrocarbon fuel vapors and usually diluted with water to a 1 percent, 3 percent, or 6 percent solution. A specially formulated foam concentrate for use on fires from alcohols and other polar solvents. A fire in flammable liquids, combustible liquids, petroleum greases, tars, oils, oil-based paints, solvents, lacquers, alcohols, and flammable gases. A liquid that has a closed-cup flash point that is below 37.8°C (100°F) and a maximum vapor pressure of 2068.6 mm Hg (40 psia) at 37.8°C (100°F). A stable aggregation of bubbles of lower density than oil or water. A homogenous foam produced by the combination of water, foam concentrate, and air or nitrogen under pressure. A concentrated liquid foaming agent as received from the manufacturer. It is the minimum flow of finished foam per square foot to extinguish a flammable liquid fire. The CAR was found for different fuels through extensive testing by the National Fire Protection Association (NFPA). The CAR for hydrocarbon fuels has been calculated to be 4.1 L/min*m2 (0.1 gpm/ft2) and the CAR for polar liquids, like alcohols, has been calculated to be 8.1 L/min*m2 (0.2 gpm/ft2). When two or more chemicals are added the foam generates due to chemical reaction. The most common ingredients used for chemical foam are sodium bicarbonate and aluminum sulphate with stabilizer. Chemical foam is generally used in portable fire extinguishers. It is produced by mechanically mixing a gas or air to a solution of foam compound (concentrate) in water. Various types of foam concentrates are used for generating foam, depending on the requirement and suitability. Each concentrate has its own advantage and limitations. Mechanical foam can further be classified as Low, Medium and High Expansion Foam. Foam expansion ratio may be upto 50 to 1, but usually between 5:1 to 15:1 as typically produced by self aspirating foam branch pipes. The low expansion foam contains more water and has better resistance to fire. It is suitable for hydrocarbon liquid fires and is widely used in oil refinery, oil platforms, petrochemical and other chemical industries. Foam expansion ratio vary from 51:1 to 500:1 as typically produced by self aspirating foam branch pipes with nets. This foam has limited use in controlling hydrocarbon liquid fire because of it's limitations w. r. t. poor cooling & poor resistance to hot surfaces/radiant heat. Foam expansion ratio vary from 501:1 to 1500:1, usually between 750:1 to 1000:1 as typically produced by foam generators with air fans. This foam has also very limited use in controlling hydrocarbon liquid fire because of its limitations w. r. t. poor cooling and poor resistance to hot surfaces/radiant heat. It is used for protection of hydrocarbon gases stored under cryogenic conditions and for warehouse protection. Class B fires generally require foam application in addition to firewater for quick and effective extinguishment of fire. Hydrocarbon storage tanks are also provided with the provision of sub-surface injection of foam to effectively stop fires by forming a impervious barrier to prevent fire propagation inside a tank which is a very big source of the fuel for fire propagation. Additionally, foams can also be used on liquid pool fires to smother the surface of the pool with foam, thereby starving the fire for oxygen and providing quick extinguishment. When trying to fight a liquid pool fire of hydrocarbons not miscible with water such as Gasoline, Diesel, JP4. heptane and kerosene a minimum application rate of 4.1 L/min*m2 (0.1 gpm/ft2) of water-foam solution should be used. For liquid pool fire due to polar solvents such as Ketones, Esters, Alcohols, MTBE, Amine which are water miscible or will mix with water, a minimum foam-water application rate of 8.1 L/min*m2 (0.2 gpm/ft2) is recommended. 5.9.2.1: Approved foam hose stream equipment shall be provided in addition to tank foam installations as supplementary protection for small spill fires. 5.9.2.2: The minimum number of fixed or portable hose streams required shall be as specified in Table 5.9.2.2 and shall provide protection of the area. 5.9.2.3: The equipment for producing each foam stream shall have a solution application rate of at least 189 L/min (50 gpm), with the minimum number of hose streams shown in Table 5.9.2.2. 5.9.2.4: Additional foam-producing materials shall be provided to allow operation of the hose stream equipment simultaneously with tank foam installations as specified in Table 5.9.2.4. Two Tanks storing Aviation Turbine Fuel (ATF) are provided in a common diked area. 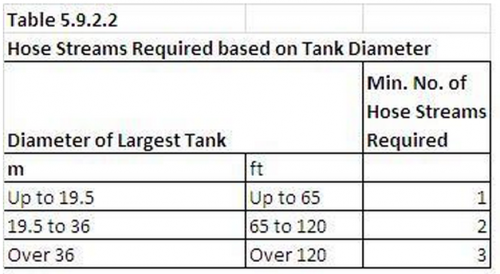 The capacity of each tank is 8895 m3. 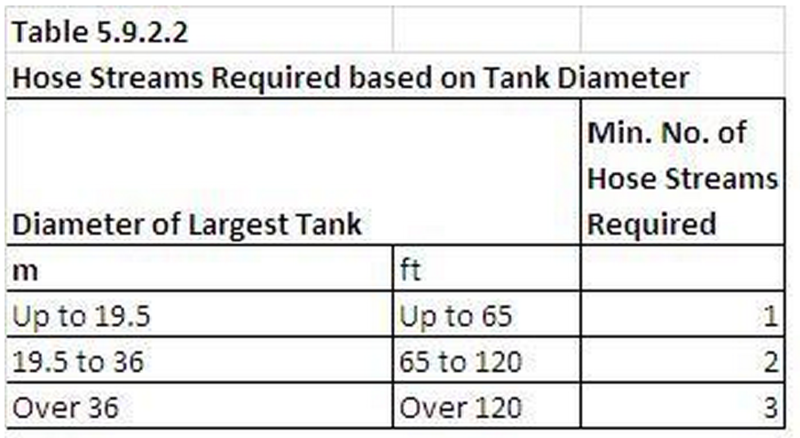 The tank dimensions are 30 m D X 12.2 m H. The containment dike for this pair of tanks is 65.5 m W X 104.5 m L. Calculate the foam-water solution requirement, 3% foam concentrate requirement & storage requirement for foam concentrate. 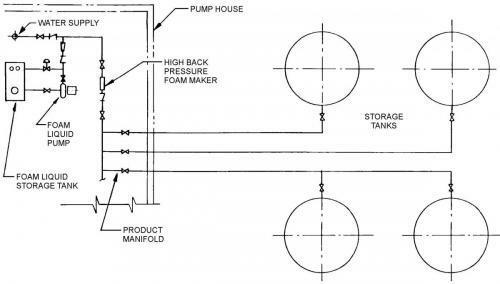 A process flow scheme for fixed sub-surface foam system is shown as an attachement to this blog entry. Tên thường gọi: Erybotrya leaf, Loquat leaf (Tỳ bà diệp). Tỳ Bà Diệp thuộc Tiểu mộc, hay còn gọi Sơn trà Nhật, Tì Bà có nguồn gốc tại vùng Đông-Nam Trung Hoa và có thể tại vùng phía Nam Nhật Bản, tuy nhiên có lẽ đã được du nhập vào Nhật từ thời xa xưa. Cây được ghi nhận là đã được trồng tại Nhật từ hơn 1000 năm truớc. Tây phương chỉ biết đến cây này vào năm 1690 qua sự mô tả của nhà thực vật Kaempfer. Ông Thunberg quan sát được cây tại Nhật vào 1712, nên đã mô tả cây với nhiều chi tiết hơn. Cây được trồng tại Công viên Quốc gia Pháp tại Paris vào 1784 và được đưa từ Quảng Đông sang trồng tại Công Viên Hoàng Gia Anh tại Kew vào 1787, sau đó cây được trồng phổ biến trong vùng Riviera, Malta và các quốc gia ven Địa Trung Hải như Algeria. Từ 1818, những chủng cho quả rất ngon đã được phát triển tại Anh (cây có thể trồng ngoài trời tại những khu vực tương đối ấm áp ở những vùng phía Nam Anh quốc. Tại Tân thế giới, cây được trồng tại khu vực phía Bắc của lục địa Nam Mỹ, Trung Mỹ, và từ Mexico sang đến California, Florida (Hoa Kỳ). Riêng tại Hoa Kỳ, cây có mặt tại Nam Florida từ 1867 và cả Carolina nhưng cây hầu như không cho quả khi trồng tại các vùng từ phía Bắc Jacksonville trở lên. Từ cuối thế kỷ 19, nhà nghiên cứu về cây CP Taft đã chọn lựa được nhiều giống khá tốt nhưng việc trồng cây không mấy phát triển. Mãi đến 1960, các cây 'lùn' được tạo bằng cách ghép cành vào các gốc quince đã giúp cây được trồng rộng rãi hơn nhất là tại Do Thái. Tại các vùng phía Bắc Hoa Kỳ và Âu Châu, cây được trồng làm cây cảnh và trồng trong các nhà kiếng. Tỳ Bà Diệp là một cây cho trái ngon, thuốc tốt được sử dụng hàng ngàn năm qua trong Y Học Cổ Truyền & Đông Y.
Bộ phận dùng: lá, lấy lá bánh tẻ (tức dày, không già, không non) . Lá tươi nặng được 40g, màu xanh lục hay hơi nâu hồng, không vụn nát, không lẫn lá úa rụng, không sâu là tốt. Theo Trung Y; Dùng miếng vải chùi sạch lông, lấy nước cam thảo lại chùi sạch, lau cho khô bôi mỡ sữa lên khắp lá mà nướng qua (Lôi Công Bào Chích Luận). Theo kinh nghiệm Việt Nam: Chọn lá xanh, to, bỏ lá vàng, nát. Để cái sàng trên một chậu nước vừa đủ ngập. Để lá trên mặt sàng, dùng bàn chải mềm chải hết lông cho kỹ. Nếu không nó sẽ gây ngứa cổ và ho. Thái nhỏ, phơi khô (dùng sống). - Nếu trị đau dạ dày thì tẩm nước gừng nướng, trị bệnh gan phổi thì tẩm mật nướng. Tẩm gừng sao vàng hoặc tẩm mật sao vàng (tuỳ theo bệnh). Ngoài ra, Lá có tác dụng hạ đường huyết, dùng trị tiểu đường type 2. - Nhiệt ở vị, biểu hiện như buồn nôn và nôn: dùng Tỳ bà diệp với Trúc nhự và Lô căn. Liều dùng: ngày dùng 12 - 18 g lá khô/ngày. Kiêng ky: hư hàn mà nôn mửa hoặc do phong hàn thì không nên dùng. Đa số các nghiên cứu về các hoạt tính sinh học của sơn trà được thực hiện tại Nhật và Trung Hoa. Nghiên cứu tại Phân khoa Dược Đại Học Okayama, Tsushima (Nhật) ghi nhận các flavonoids và flavonoid glucosides (loại glycopyranoside) ly trích từ lá sơn trà, gọi chung là các polyphenols có khả năng diệt bào chống lại một số giòng tế bào ung thư miệng nơi nguời (như tế bào ung thư màng miệng loại sarcoma, ung thu hạch nước bọt). Ngoài ra các polyphenol này cũng ức chế được sự khởi hoạt của các sinh kháng thể của siêu vi trùng Epstein-Barr nơi tế bào Raji. Hoạt tính này được xem là do các polyphenols Roseoside và Procyanidin B-2 (Journal of Agricultural and Food Chemistry Số 50-2002). Nghiên cứu tại Viện Khoa Học Trung Hoa (Nam Kinh) ghi nhận dịch chiết từ lá khô sơn trà bằng alcohol 70% (EJA-0) , thử nghiệm trên chuột bình thường và chuột bị gây tiểu đường bằng alloxan, với các liều 15, 30 và 60 gram (trọng lượng thô)/ kg có hoạt tính giúp hạ mức đường rõ rệt nơi chuột bị tiểu đường gây ra bởi alloxan: liều 30 gram/kg EJA-0 hiệu nghiệm hơn liều phenformin 100 mg/kg. Ngoài ra dịch chiết sesquiterpenes tổng cộng từ lá cũng có hoạt tính hạ đường rõ rệt, và không gây độc tính dù dùng liều cao (LD50= 400.1g/kg) (American Journal of Chinese Medicine Số 35-2007). Một nghiên cứu khác ghi nhận hợp chất Nerolidol-3-O-alpha + rhamnopyrosyl (1->4)-alpha-l-rhamno pyranosyl (1->2)-[alpha-l-rhamno pyranosyl(1->6)]-beta-dglucopyranoside, ly trích từ lá sơn trà khô có hoạt tính làm hạ đường trong máu nơi chuột thử nghiệm. Hoạt tính này có thể so sánh với tác động của các thuốc thuộc nhóm glicazide (Phytomedicine Số tháng 7 năm 2007). Nghiên cứu tại Đại Học Napoli (Ý) ghi nhận các hợp chất loại glycoside 1-3 và các triterpenoids poly hydroxylated 5-6, lấy được từ dịch chiết lá sơn trà bằng Methanol, có những tác dụng gây giảm lượng đường trong nước tiểu và trong máu của chuột bị gây tiểu đường bằng cách biến đổi di thể và cả trong chuột bình thường. (Planta Medica Số 57-1991). Các hợp chất acid loại triterpene trong lá sơn trà được ghi nhận là có tác động trên các cytokine (gây phản ứng sưng-viêm) và điều hợp hoạt động của các đại thực bào nơi phế nang (alveolar macrophage) của chuột bị gây sưng phổi kinh niên. Các thử nghiệm tại Trường Dược Đại Học Anhui (Trung Hoa) đã chứng minh được là các hợp chất trên ức chế được sự khởi động các NF-kB nơi đại thực bào phế nang dẫn đến điều hạ các hoạt động của THF-alpha, IL-1, PGE(2) và LTB(4) là những hợp chất có những vai trò quan trọng trong tiến trình sưng-viêm nơi chuột bị sưng phổi kinh niên (Inflammation Research Số 56-2007). Nghiên cứu tại Đại Học Quốc Gia Hán Thành (Korea) ghi nhận một số hợp chất glycoside loại sesquiterpene, ly trích từ lá sơn trà, có hoạt tính ức chế Yếu Tố mô (Tissue factor= TF, tissue thromboplastin là một glycoprotein dính nơi màng tế bào, có hoạt tính gây gia tăng sự đông máu). Liều hữu dụng gây ức chế 50% hoạt động của TF là 20 micoM/TF units. (Archives of Pharmacy Research Số 27-2004). Hạt sơn trà chứa các acid béo chưa bão hòa linolenic và linoleic cùng betasitosterol, có thể ly trích bằng dung dịch alcohol 70% và methabol. Các dịch chiết này khi thử trên chuột bị gây sưng gan bằng dimethylnitrosamine cho thấy có những hoạt tính như giúp giảm các chỉ số AST, ALT và hydroxyproline (Các chỉ số này tăng cao nơi những bệnh nhân bị sưng gan), đồng thời các triệu chứng xơ gan cũng giảm hạ và cải thiện (Biology and Pharmacy Bulletin Số 25-2002). Dược học cổ truyền Trung Hoa dùng lá cây sơn trà làm thuốc dưới tên Tỳ Bà diệp (Pí pà yè). Dược liệu là lá của cây sơn trà trồng tại các vùng Trung, Đông và Nam Trung Hoa, nhất là Quảng Đông, Giang Tây. Lá có thể thu hoạch quanh năm. Nhật được Kampo gọi là biwayò. Chuyển biến= Hóa Đàm, Thanh Nhiệt Phế, Giáng Phế khí , dùng trong các chứng Phế 'nhiệt' gây ho với các triệu chứng ho khan, hay ho với đàm đọng nơi cổ họng, kèm theo tức ngực. Trong các trường hợp này: Lá tỳ bà được dùng chung với Hạnh nhân (Xing-ren). Điều hòa Vị, Thanh Vị nhiệt và Giáng Vị Khí dùng trị các chứng buồn nôn, ói mửa, nấc cụt, ợ hơi gây ra do Vị 'nhiệt'. Dùng chung với Hoàng Cầm (huang-qin) và Hương phụ (cỏ cú) khi bị ói mửa và ợ hơi. Dùng chung với Bạch mao can nếu ói mửa ra máu. Liều thường dùng trong Đông Dược là 4.5 đến 12 gram lá khô hay 15-30 gram lá tươi. Lá tỳ bà thường được tẩm mật ong rồi sao (để tăng thêm tác dụng 'nhuận Phế’) hay tẩm nước gừng tươi để tăng tác dụng trị nôn, ói mửa. Lá tỳ bà cần làm sạch hết các lông măng để tránh gây khó chịu nơi cổ họng. Không nên dùng lá tỳ bà trong trường hợp ói mửa do Vị 'hàn', và trong các trường hợp ho do hàn khí nhập Phế. Tại Ấn Độ: Cây được gọi là lagat, lokat. Quả được dùng giải khát và chống nôn mửa; nước sắc lá dùng trị tiêu chảy. Hoa dùng làm thuốc trị ho, long đờm. - Trị các truờng hợp sưng cổ họng kinh niên và cấp tính: Dùng 90 gram quả tươi, bỏ vỏ và hột, thêm 15 gram đường, chưng cách thủy trong 30 phút. Ăn quả và uống nước ngày 2 lần: sáng và chiều tối. - Trị khát nước nhiều, khô cổ họng; nước tiểu ít và đỏ: Dùng 250 gram quả thật chín, bỏ vỏ và hột rồi ăn sống ngày 2 lần. - Trị ho: Dùng 9-15 gram hạt, nghiền nát. Thêm 3 lát gừng tươi. Nãu lửa nhỏ trong 5-10 phút. Uống ngày 2 lần. - Trị táo bón nơi người cao niên: Dùng 9-15 gram hạt, nghiền nát, đun lửa nhỏ; lược lấy nước thêm 30 gram mật ong, và uống ngày 1 lần. Trong Tỳ bà diệp hàm chứa B17 trong Hạnh nhân. Lấy Tỳ bà diệp sấy lửa, chườm xoa vào da chổ bệnh, có thể giảm đau chứng ung thư, đồng thời có thể làm cho chứng ung thư chuyển biến tốt. Có một người lấy lá Tỳ bà diệp thái nhỏ, đóng vào túi vải, sau khi để lên bề ngoài chổ bệnh, dùng hơi ẩm làm nóng lên, trị khỏi ung thư tử cung của vợ mình. Tỳ bà diệp có thể chế thành cao sử dụng, hoặc lấy loại tươi sau khi đắp lên da, dùng cây nhang ngãi đốt làm nóng lên, có thể thu được hiệu quả tốt. Tiến sỉ Hậu Đằng Mỹ Cơ bác sỉ nha khoa Đại bản Nhật bản, bị chẩn đoán là ung thư bao tử, ung thư tụy, ung thư thực quản, nhưng qua thời gian 6 năm chưa thấy chuyển biến xấu, sau khi qua lâm sàng kiểm tra, dấu tích ung thư đã tiêu mất. Đó là kết quả tổng hợp các phương pháp, sau khi ông ấy bị chẩn đoán là ung thư, nhưng ông vẫn giử vững tinh thần, đồng thời chọn lấy liệu pháp điều trị ăn tự nhiên, liệu pháp điều trị Tỳ bà diệp. Tôi vì muồn càng nhiều người dể dàng hiểu kết quả thí nghiệm, tôi tìm một bệnh nhân ung thư dương vật nằm viện dùng liệu pháp điều trị Tỳ bà diệp cho bệnh nhân thấy kết quả. Phương pháp là theo thứ tự là lưng, vùng bụng, chổ bệnh, 1 ngày 3 lần, 1 lần điều trị 1 tiếng đồng hồ, cứ mỗi 1 tuần chụp phim tổ chức đó 1 lần, lúc chụp đến tấm 49, tât cả tế bào ung thư bổng không thấy nữa, lại sinh ra tổ chức khoẻ mạnh. Bác sỉ chủ nhiệm vì đó mà vô cùng vui mừng . Rất nhiều ca bệnh ung thư được chữa khỏi dùng thành phần hữu hiệu của Tỳ bà diệp, nhưng cho đến nay trong giới y học vẫn chưa tìm được căn cứ lý luận của khoa học hiện đại. Song sự thật nhiều người đều biết dùng thành phần hữu hiệu của Tỳ bà diệp, tác dụng lên vùng bệnh, đồng thời lúc gia nhiệt thì đau nhức của ung thư lập tức tiêu mất, không ngại có thể dùng thử. Ung thư bao tử, loét bao tử lấy Tỳ bà diệp thái nhỏ, đóng vào túi vải để lên vùng bụng, mặt trên để túi muối ăn sao, trên túi muối ăn phủ 1 lớp ny long, để ngăn thành phấn hữu hiệu của Tỳ bà diệp phân tán. Dùng loại tươi càng tốt, không có loại tươi có thể lấy loại khô thái nhỏ, làm ẩm ướt cũng được. Như trên đã nói liệu pháp Tỳ bà diệp trị ung thư, y học hiện đại đã bắt đầu bắt tay nghiên cứu, nhưng cho dù thế nào thành phấn hữu hiệu của Tỳ bà diệp có thể làm huyết dịch kiềm tính hóa, từ đó đề cao tỉ lệ trị khỏi tự nhiên là một sự thật không lay chuyển. Lấy Tỳ bà diệp tươi (không có thứ tươi có thể dùng thứ khô thay thế) thái nhỏ, thêm vào cồn y tế lượng gấp đôi nó ngâm 1 tuần, để ngâm chiết lấy thành phần hữu hiệu của nó, đợi lúc cồn đổi màu nâu đen, lấy khăn lông thấm vào nước nóng vắt khô, gấp 3 nếp, nhún vào dịch ngâm chiết thân cây Tỳ bà đến khi khăn lông hiện ra sắc xanh lam, sau đó trải tấm vải nhựa lớn, đặt cái khăn lông lên trên, để vùng lưng sau bộ vị gan của người bệnh sát vào khăn lông nằm lên trên nó, 1 lần nằm 20 phút, 1 ngày nằm 2 ~ 3 lần, có hiệu quả. Cùng lúc này, dùng dịch ngâm chiết thêm 2 lần nước, xoa vào bộ vị gan, hiệu quả điều trị càng tốt. Phương này là do Tỉnh Thượng Tân Thái Lang Nhật bản phát hiện, dùng hơi nước Tỳ bà diệp điều trị 65 ngày, trị khỏi ung thư trực tràng cho vợ mình. Phương pháp là lấy Tỳ bà diệp thái nhỏ, sau khi chưng hơi làm cho thành phần hữu hiệu của nó, thông qua máy quạt gió hun xông vào chổ bệnh, ông ấy dùng phương này trị khỏi nhiều chứng ung thư, sưng loét, hiệu quả của nó đã làm cho mọi người quan tâm chú ý tới. Pi Pa Ye (Folium Eriobotryae) is also known Asloquat leaves. The bitter and cool herb has been used in Traditional Chinese Medicine as anti-cancer, anti-oxidationAntibiotic, anti-inflammatory, anti-diabetic agent and to treat rid of jaundice, improve appetite, inhibit the forming of fibrosis, etc. as it transforms Phlegm, calms cough, harmonizes the Stomach, subdues Rebellious Stomach-Qi, etc., by promoting the functions of lung and stomach channels. In the study to investigate the possible therapy mechanism of triterpene acids of Eriobotrya japonica (Thunb.) Lindl. Leaf (TAL) in alveolar macrophage (AM) of chronic bronchitis (CB) rats, found that SB203580, a p38 MAPK inhibitor, (10 muM) significantly inhibited inducible nitric oxide synthase (iNOS) mRNA expression in AM. This data indicate that TAL highly decreases excessive iNOS expression and NO induction, and p38 MAPK signal transduction participates in iNOS expression and NO induction in AM of CB rats. The effect of TAL on iNOS expression in AM may be related to its inhibition of p38 MAPK signal transduction(1). In the observation to evaluate the effect of triterpene acids of Eriobotrya japonica (Thunb.) Lindl. leaf (TAL) on expression of antioxidative mediators by alveolar macrophages (AM) in rats with chronic bronchitis (CB), indicated that TAL inhibits HO-1 expression and MDA production and up-regulates SOD expression in AM from CB rats, which might be one of molecular mechanisms of its anti-inflammatory effects in CB rats(2). 2. Do not use the herb in newborn, children or if you are pregnant or breast feeding without forst consulting with the related field specialist. Bài viết này Tôi xin gửi đến 2 Anh của tôi là Tín Hồ & Tiên Hồ. Nguyện xin ơn trên và Thánh ân các Ngài tuôn đổ trên các Anh, luôn phù hộ cho các Anh được khỏe mạnh.